It may be the shortest month of the year, but Wednesday’s Copa del Rey semi-final first leg against Atlético Madrid will be the first match in a long line of challenges for FC Barcelona in February. Luis Enrique’s men will be competing in seven matches across 28 days in three different competitions: La Liga, Copa and Champions League. After Atlético in the cup, the ever combative Athletic Club come to town for Week 21 of La Liga, before Diego Simeone’s men also visit Camp Nou in midweek for the Copa second leg. With just a few days to take a breather, Barça travel to Alavés where the blaugrana will be seeking revenge for the 2-1 defeat suffered at home earlier in the campaign. Then it is off to Paris for the Champions League Round of 16 first leg against PSG, followed by a league home game against Leganés. 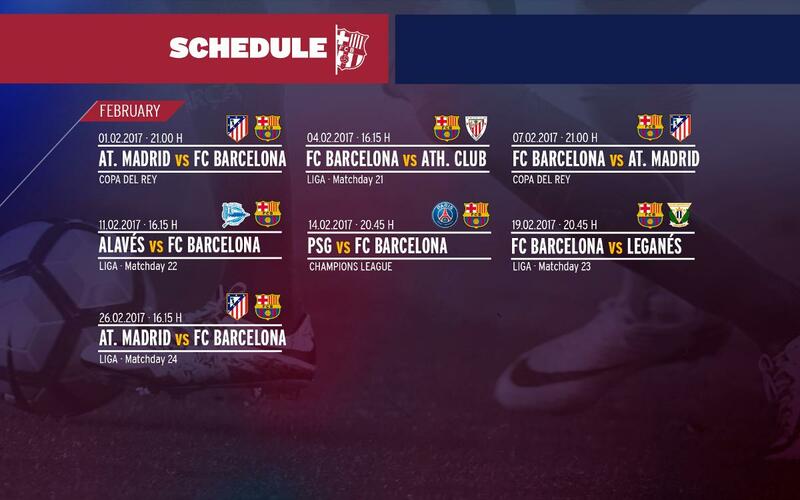 The busy month ends as it begins, with a trip to the Vicente Calderón to face Atlético Madrid, this time in La Liga. February tends to be a positive month for Barça: in the 2014/15 season, of the seven games played, only one was lost, against Málaga at home. There were two wins over Villarreal, a big victory at San Mamés and another at Manchester City. The following year saw seven wins and one draw, with massive results over Valencia (7-0) and Celta (6-1) as well as an important advantage in the first leg of the European tie at Arsenal (2-0).